Tax evasion and avoidance: HMRC estimates that £35bn is dodged in tax. Nobody can know the actual figure, as so much secrecy surrounds tax dodging. Credible estimates put it at over £70bn. There is a huge and complex list of perfectly legal ways that corporations and the very rich can avoid tax – a bit like “claiming on expenses” but more sophisticated. Yet the ConDems are cutting the number of HMRC staff who investigate tax evasion and avoidance, and their efforts to “simplify” the tax system never include simplifying those loopholes. Labour never focussed on this when they were in power. Suggest a policy: Increase HMRC staff, and monitor their performance. The cost will be peanuts compared to the sums involved. These loopholes must be closed, and the penalty for deliberate evasion should be a prison sentence. Cut the cost of housing: The average tenant spends a fifth of their income on rent, and those costs are rising. More and more people are being priced out of the housing market because wages continue to fail to keep up with the rising cost of buying a house. The charity Shelter says 1.6 million children in Britain live in housing that is overcrowded, temporary, or run-down. Yet the government’s proposed building of 150,000 affordable homes over four years is less than a third of what is needed. This will leave millions of families stuck in limbo on housing waiting lists, and push house prices further out of the reach of those on ordinary incomes. Perfectly decent house-owners are genuinely afraid of what might happen if their property prices level off or even fall. But the less money everyone spends on housing, the more everyone spends on other parts of the economy that generate jobs, taxes and pensions for all. Cutting the cost of housing, just as cutting the cost of any other essential service (energy, telecoms, transport, health, pensions, banking) will directly benefit the whole economy. Since the early 1970s UK house prices have tripled in real (inflation-adjusted) terms. In Germany, the cost of residential property has barely budged in real terms in the past 40 years. Suggest a policy: Build 600,000 affordable homes over the next 4 years. Taxpayers are still subsidising the banks after the bailout: Taxpayers continue to pay a £50bn “insurance policy” subsidy every year to insure the banks against collapse. As we all know, they just collected on that insurance. No major party intends to fully separate retail banks from investment “casino” banks. Remember, it was the casino banks that were the main cause of the banking crash but, because they belonged to the same company as the retail banks, they dragged their retail banks – and therefore all of us – into this crisis. Suggest a policy: Force retail banks to sell off their “casino” banks so they are no longer connected. Gas and Electricity bills: Energy is an essential service. Everyone has an energy bill they have to pay. 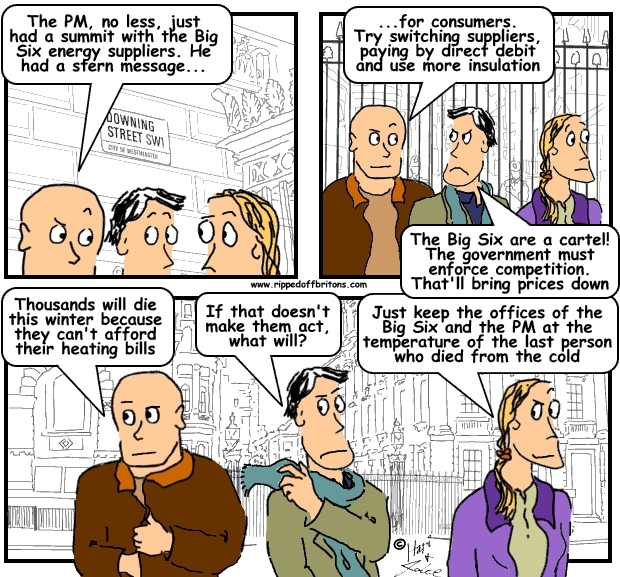 So if energy firms overcharge us, it affects the whole economy. 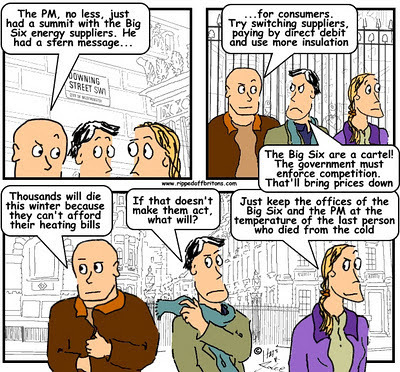 The suspicion is that the “Big Six” energy firms operate as a cartel and therefore don’t compete to bring down prices. Some estimates put this profiteering at £4bn a year. But even this figure may be a gross underestimate. The big energy firms are split into "upstream" and "retail." "Retail" sell you the energy, and their profit margins can be reasonable. However, they buy their energy from their "upstream" parent company; nobody knows whether they are hiding their profits in the parent. The energy regulator OFGEM had to hire forensic accountants to investigate whether the energy firms are overcharging us. Absurdly, OFGEM rejected most of the recommendations that came out of that report. So regulators and politicians prefer to talk rather than act decisively. What’s worse, this is one rip-off that kills. An estimated 2,700 died from fuel poverty over the last winter. Yet last year many energy firms recorded record profits whilst raising their prices. Suggest a policy: Force energy firms to show us their books. This will reveal whether they operate as a cartel. MP’s pay: If an MP’s salary in 1975, of £5,750, had simply risen in line with RPI inflation, then in 2007 it would be £34,801 rather than the actual £60,675. Even worse, an MP’s allowances/expenses in 1975, of £3,200, would have risen to £19,367 if RPI inflation had been applied, yet the actual 2007 figure was £90,505. In 1993 an MP’s basic salary was £30,854. This was about the same as a mid-level ordinary teacher’s salary. In 2008 MP’s basic salary was £61,820 – off the ordinary teachers scale entirely. I leave it to you to judge whether our current batch of MPs are ‘off the scale’ in terms of quality compared to those of 20 years ago and before. Overpaid elected representatives, be they MPs, councillors, mayors, etc., will never truly feel the impact of policies aimed at ordinary Britons if their salaries are extraordinary. Suggest a policy: The pay of elected representatives must not rise faster than the average pay increase for the nation. make ukba and dwp pay for tribunals rather than moj. they might make better decsions.